1. Social Influences and Reputation Tracking. Most organizations badly want to know if the information they see in their social networks is accurate and authoritative. Externally, they also want to be able to identify and keep tabs on social influences. 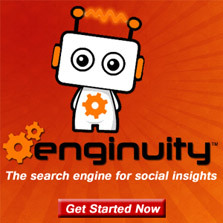 Social BI can be used to build and manage large datasets needed to power such things as Enginuity’s search engine. By providing such BI tools aimed at discovering social influences and identifying reputation organizations can find the right answers. 2. Human Resources and Recruitment. Understanding employee performance and identifying external talent to recruit can be leverage through social insights. Finding new talent that is socially relevant can easily lead to the hiring of top talented software engineers, executives and others. 3. Brand Insights and Awareness. While brand monitoring is easier in social media than just about any other medium, monitoring alone can require serious big data capabilities. But monitoring alone isn’t enough and making sense of the mountains of information that brand analysis can create, especially in real-time, is where Enginuity comes into play. Brands can discover socially engaging information about themselves to promote it further and bring greater brand awareness. 4. Social Supply Chain Management. 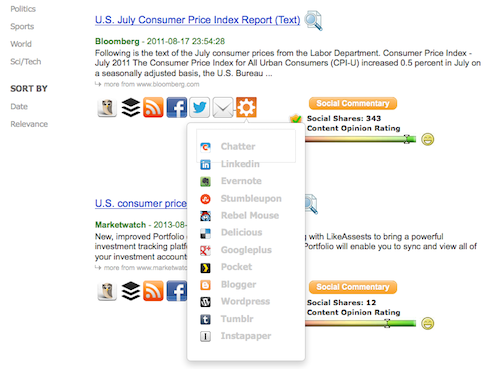 SalesForce.com social Chatter tool can be deployed as the preferred collaboration medium between brand owners and their top suppliers. Giving the ability to capture the back and forth discussions, sharing of information on forecasts, purchase orders, engineering changes, shortages, and social insights found on the web versus using email, IM, fax, etc. 5. Measure Marketing Success. Using a social search such as Enginuity within your organization you gain visibility into your marketing campaign reach, you can analyze which messages are resonating on which networks and can optimize campaigns based on these insights. Our social relevancy rankings give you insight into which content is most frequently shared with your clients’ network and whether that content generates shares, likes, re-tweets, comments, traffic and increased business…even outside your immediate network. 6. Deepen Customer Relationships. Enginuity social network integration allow you to extend your direct connections to develop relationships with second and third level contacts and beyond. With knowledge of social updates at your finger tips you can find and share content tailored to the interest of your social networks, you can demonstrate your areas of expertise and engage in ongoing dialogue with your connections in a scalable way. With Enginuity, you can make social media a part of your daily success and save time as you generate new business. 7. Sales Funnel Analysis. Reports and stats managed functions have been a cornerstone for sales, but as demand generation increasingly focuses on social channels for building the inbound funnel, social insights can build a clear and integrated picture of what that funnel looks like in real-time without painstaking and time-consuming manual data collection and analysis with platforms like Enginuity Search and Kontagent. The social media sales funnel. 8. Solutions for Product Management. Success in product management is difficult. It requires delivering products that work seamlessly. The need to be flexible enough to listen, gather and incorporate customers’ feedback through development in order to give them the experiences they crave. Data is your best tool for the job, and social insights gained through Enginuity can show you how to leverage that data to create customer-focused product experiences that will drive engagements, and loyalty to a business. 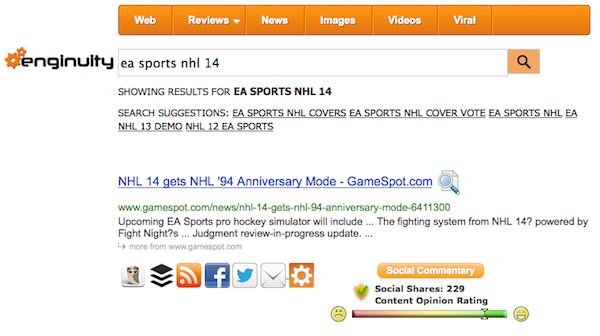 Gain valuable insights from the social web for product management strategies.